LET’S GET COOKIN’. Chef instructors Jonathan Fike, left, and Kevin Brown, oversaw the creation of an instructional kitchen at Chippewa Valley Technical College. With the focused attention of two veteran chefs poised to open a new restaurant, Kevin Brown and Jonathan Fike have spent recent weeks making sure their gleaming new kitchen is just right, down to the last sharpened knife and vent hood. What the pair are about to launch, however, isn’t a new eatery: it’s the brand-new culinary management program at Chippewa Valley Technical College in Eau Claire. 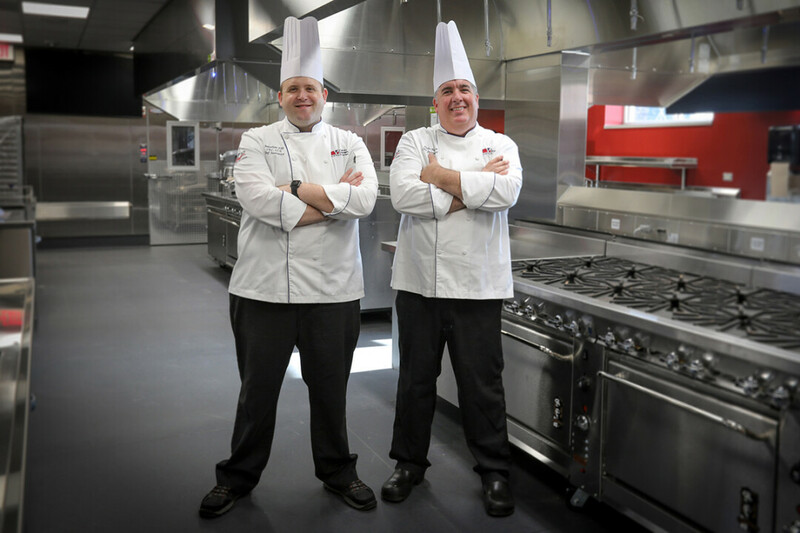 Beginning last year, when they were hired as chef instructors, Brown and Fike have overseen the renovation of what used to be classroom space at CVTC’s Business Education Center into a 5,900-square-foot culinary center. In addition to a demonstration lab that can double as a small restaurant (and includes a bar in the corner), there’s a nearly 2,000-square-foot production kitchen with three lines, a bakery, and extensive support space including coolers, freezers, lockers, and dry storage. “It’s a once-in-a-lifetime opportunity to do this,” Brown said of being able to build a culinary program from the ground up. He and Fike have researched every piece of equipment, prepared their curriculum, and readied themselves for their first students, who will begin classes the last week of August. CVTC President Bruce Barker said the culinary management program was created to meet the needs of local employers as well as to help expand the economy through the creation of new businesses. Wisconsin’s technical college system was created for this very purpose, and considering about 10 percent of the Chippewa Valley’s workforce is involved in food and hospitality, he said, it’s fitting that CVTC would offer a program to serve that sector. CVTC asked local employers about what workers needed to know, he said, and found they were looking for people who could handle the management side of the culinary business, including costing menus and overseeing staff. Brown and Fike said the program, particularly in its later semesters, will emphasize such management skills. In a typical restaurant kitchen, Brown said, you’ll find everyone from 18-year-olds to 60-somethings, and he expects the CVTC class to be similar. Among the many management skills these students will learn is how to get employees of diverse age groups to work together. “There’s more to the culinary industry than being a chef,” Fike said. “... or being on Food Network,” Brown added. Making good food is part of being successful in the industry, but so are skills in contract negotiation and human resources, he explains. Those who complete the full, two-year program will receive an associate’s degree and the opportunity to transfer credits to UW-Stout and apply them to a bachelor’s degree in the university’s hospitality program. Other options are also available: Those who complete a semester can receive a certificate while those who complete a year will receive a technical diploma. Students will learn a variety of skills they’ll need to work in – or to manage – a restaurant, beginning with basics such as how to use a knife correctly and how to handle food safely. In later semesters, students will get in-depth instruction on different methods of cooking; will learn how to prepare a variety of international cuisines, including Latin American, Asian, Middle Eastern, and Mediterranean; will create everything from sausages and baked goods to ice cream and pasta; and will gain skills in developing restaurant concepts, creating menus, and even branding. And the students won’t just be cooking for themselves: Pop-up restaurants catering to CVTC students, staff, and visitors are also planned. Both chef instructors have extensive backgrounds in education and industry: Brown is a graduate of the New England Culinary Institute in Vermont, worked at restaurants in Washington, D.C., and Maryland, and taught at Nicolet College in Rhinelander; Fike is a graduate of the Culinary Institute of America in Hyde Park, N.Y., worked as a chef and executive kitchen manager in Massachusetts and Florida, and led the culinary arts program at Davis Technical College in Utah. Brown emphasizes that the new program will prepare the students to be culinary professionals, and as such, students will be held to high standards. “Our intention is to deliver the same quality of education that we got privately at a community college price,” he said. Learn more about the CVTC Culinary Management Program at cvtc.edu/academics/programs/culinary-management.